TAY Kart Klub: Who's In!? Wahoo! 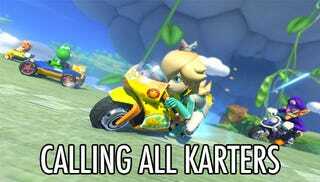 Mario Kart 8 is on the horizon and I can't wait to meet up with all you lovely Wii U folks on the track. For this reason I have created the TAY Kart Klub (or TAYKK). The only TAY group that miiiiight sound like some racist gathering. BUT IT ISN'T! I promise. It's for Mario Kart. Who will be getting Mario Kart 8 this coming weekend? I'd love to get racing as early as next week. I think it'll be a blast. Vroom! Vroom!